The port of Beira in Moçambique is situated at the mouth of the Pungue River at Longitude 34º 50' E and Latitude 19º 51' S. Time Zone is GMT+2 hours. The town of Beira is relatively modern, having been founded at the same time as Johannesburg (late 19th century), after having been identified as a potential port by the Portuguese explorer Paive de Andrade. This activity and rush to create a port and town occurred during the scramble between the Portuguese and British over the occupation of land in eastern southern Africa, with the British (in the form of Cecil John Rhodes' Chartered Company), having a strong interest in securing a sea link for the newly chartered lands of Rhodesia. De Andrade's report was followed by a hydrographic survey of the river and bar and in 1887 a Portuguese military post was established, out of which the town grew. Beira, which is now Moçambique's second largest city, took its name from the Portuguese crown prince D Luis Filipe, who had been given the title Prince of Beira - the latter place being a region in central Portugal. By 1889 channel buoys marked the entrance to the Pungue estuary and six years later work began on the first landing stage. A wooden pier was also constructed to serve the railway, which was then under construction. By the mid to late 1920s construction of deepwater berths and improved anchorage at Beira had begun under the control of the company named Companhia do Porto da Beira, which continued to administer the port until 1949 when the Moçambique Ports & Railways Company (CFM) took over administrational control. On 15 October 1998 a joint venture was formed between Cornelder Holding, based in Rotterdam (67%) and CFM (33%) for the management of the Beira Ports (Container and General Cargo Terminals) by Cornelder de Moçambique (CdM). Cornelder de Moçambique is now a key partner in the economic development of the east southern African region and a principal catalyst in promoting this development. In its bid to spearhead economic development in the region CdM has engaged in a joint venture with a Zimbabwean Company located in Mutare (GMS Freight) where Dry Port facilities are being offered (inland container Terminal). The port remains directly linked to the hinterland (Zimbabwe and Zambia) by road and rail networks, and currently by road only to Malawi. However, the Sena railway line linking Beira with Malawi and the Tete Province is currently being rehabilitated. A pipeline constructed in 1960 links the port with Zimbabwe and Beira Port also has direct sea links to Europe, Asia and the world at large. Beira port has a total of 11 berths stretching over a total length of 1994 meters, excluding berth number 1, which is reserved as a fishing harbor. Beira is 319km from the Zimbabwe border at Machipanda and 685km by good condition road from Malawi via Nova Vanduzi. The port handles a variety of cargo from breakbulk, neo bulk and bulk including petroleum products. Access to the port is obtained via the dredged Mancuti Channel (17 n.miles from the Mancuti lighthouse). Ships waiting for berthing instructions are required to anchor east of the outer channel. The port is tidal with a MH spring range of 6.2 - 7.4m. Vessels awaiting berth must anchor at the bar. The approach to the River Pungue is obstructed by numerous banks and shoals, which are constantly changing. From the north end of Channel Rambler, the entrance channel is marked by light buoys west of Cbadelo light (metal mast, 4m in height), exhibits 9 cables north northwest of Ponta Gea on the edge of a bank fronting the shore between Ponta Gea and Ponta Chiveve. The port is open 24 hours a day although night navigation is restricted to vessels up to 7m draught and LOA of 140m. Pilotage and tug assistance is compulsory at all times, with pilots joining ships near P Buoy. Vessels with a draught of 4.88m or less may enter the port at any state of the tide. Those drawing more than 4.88m are required to wait for a suitable height of tide before entry. In the wet season with a high river, the ebb stream can attain a rate of up to 6 knots at springs and 2 - 3 knots at neaps. Beira is served with two 2,200BHP, 35t bollard pull tugs, a pilot boat and a mooring launch, available 24 hours a day. One of the tugs is named Pungue. A private company performs dredging within the port and channel. The port employs five pilots. During 2004 a total of 208 ocean-going ships called at Beira in addition to 80 coastal vessels. The container terminal handled 46,775 TEUs, which consisted of 240,333 tonnes landed (imported), 240,669 tonnes shipped (exported) and 48,456 tonnes of coastal traffic. General cargo handled consisted of 345,729 tonnes of cargo landed, 486,032 tonnes shipped and 6,019 tonnes of coastal general cargo. Total port throughput in metric tonnes amounted to 1,367,238 tonnes. The multi-purpose and Container Terminal is one of the most modern in southern Africa and covers 645 metres of berth length, comprising of berth numbers 2, 3, 4 and 5 with a designed depth alongside of about 12 metres. The terminal design capacity is 100,000 TEU's per year. 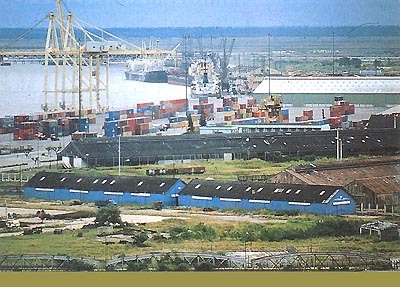 The General Cargo Terminal covers 670 metres berth length, comprising berth numbers 6, 7, 9 and 10. The terminal design capacity is 2,300,000 metric tonnes per year. The designed depth alongside of the quays is 10 metres. All activities of CdM are fully computerized utilising a Port Management System (PMS). The system can be accessed by the client via internet to provide information on the status of their cargo. Berth 6 is for refrigerated cargo including citrus exports, vegetables and other fresh products. The coal terminal is on berth 8, and the oil terminal is at berths 11 and the new berth number 12 further upstream, where tankers of up to 60,000DWT and a 12m draught are catered for. Beira has a small dry dock for vessels up to 110m LOA. The port has good ship chandling and stevedoring services. A ferry service operates to other small harbours along the coast including Buzi, Sofala, Chiloane, Machanga, Nova Mambone. Bunkering is available.